That’s what yesterday was all about. What was yesterday? Only the Good Housekeeping SA media introduction event. 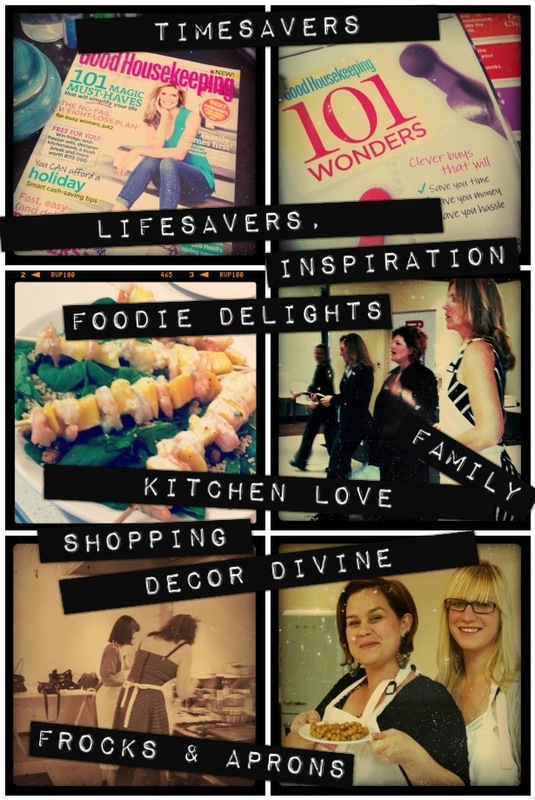 Held at the gorgeous Pick n Pay Good Food Studios in Bryanston – my BFF & I joined a few bloggers and other industry shakers for a morning of indulging our inner domestic goddesses, with the passionate Good Housekeeping SA team. Good Buys – From beauty and fashion to must-have home items, this section offers readers a variety of useful, fun and affordable buys. Good (Enough) Housekeeping – Clever ideas, smart cheats and easy fixes for the home. Good Health – A roundup of smart ways to stay well, eat right and get fit. Good Looks – Beauty and fashion news, deals and trends. Good Buzz – The stars talk about their homes, families and fashion. Good Advice – Our experts share their advice for your family, your money and your life. Good Choices – What to buy, skip and know. This section includes Good Housekeeping’s monthly product reviews, where each product gets put through rigorous testing. It also includes the monthly column by our consumer expert, who answers readers’ questions regarding consumer issues. Good Food – Test-kitchen recipes, ideas and tips. In true Good Housekeeping tradition, all recipes in this section are tested three times to ensure that they are easy to make, fast and reliable. Food expert Sharon Glass also shares her tips with readers. After flipping through the magazine, and spending some time on my fiance’s recliner chair (while he was at gym) with a glass of wine in hand – I have to say that it’s absolutely fantastic to find a magazine that’s aimed at just about everything I’m interested in. Not just a niche magazine. A magazine that’s not a schleb gossip rag, nor aimed directly at the 20-something sexually-free independent career-driven woman. It’s a magazine that targets every aspect of my identity as a woman. I think we’ve reached a level in our collective feminism where it’s okay to admit to wanting to be a stay-at-home-mom or wanting to be aSuzy Homemaker – and to do it in such a way that goes beyond a Martha Stewart/Stepford Wife stereotype – ie: to do it with style. I’ve made it no secret that I’ve revelled in being a housewife/home-maker/work-from-home/stay-at-home mom this year. It’s been good for me, and it’s opened my eyes to my priorities. DIY is fun. Cooking for my family (and proper nutrition) is important. Looking after our house and creating a gorgeous living space is cool. Making the most of time together as a family is essential. And that’s what this magazine does for me: it’s affirmation of the fact that in a world where women have won the right to dominate in the career world, other women have, at the same time also won the right to choose to return to staying at home. Women have also won the right to do it all and have it all, however they might choose it. To multitask and to balance. And the Good Housekeeping magazine is for each of those women, in all aspects of their being and doing. It’s also not another glossy filled with gorgeous things no one can afford/make time to do. All of the items are accessible, affordable and have been tried, tested and declared trustworthy. Health, wealth, love, family, entertaining, celebrations, work, kids, sports, beauty, fashion, pets – it’s all there, and it’s all between these covers. So have you picked up a copy yet? What do you think? *Available for the super-reasonable price of R24.95 – and there’s an Afrikaans version, too! The launch issue of Good Housekeeping is also packed with great giveaways and fabulous prizes, including Electrolux fridge-and-freezer sets worth R36 000 and Le Creuset kitchenware worth R40 800. Five readers will also win stylish clothing from Heidi Klum’s spring capsule wardrobe, while another five will win Guess shoes similar to the ones worn by Heidi on the cover. For more info on subscriptions, see here. This entry was posted in family things, life things, love things, parenting things, relationship things, work things and tagged blog love, blog things, blogging, competitions, cooking, Good Housekeeping, good stuff, growing up is hard to do, heart, life in south africa, life things, love things, magazine, recipes, Twitter. Bookmark the permalink. I like the sound of it! Sounds good. Going to pick up a copy on the way home.